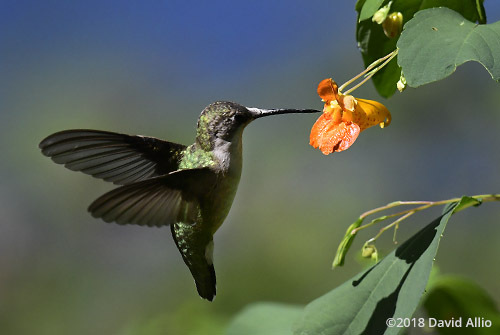 A female Ruby-throated Hummingbird Archilochus colubris feeds from a Jewelweed Impatiens biflora in the buffer zone of Lake Blalock in Upstate, South Carolina. This buffer zone is intended to serve as naturalized erosion suppression for the lake, a water supply for the Spartanburg Water System. Additionally, native vegetation within the buffer zone encourages proliferation of wildlife.